Occasionally we discover a very special and impressive item offered for sale. This beauty of a rainbow trout leaping from its mountain pond is a spectacle. The waterfall created from a mountain stream is the focal point of this oil painting which beautifully portrays the elements of the ultimate fishing experience: the best of mother nature's settings coupled with a well fed stock of potentially trophy specimens tempting the committed angler. The design and execution of this experience's portrayal is as fine as the experience it portrays. 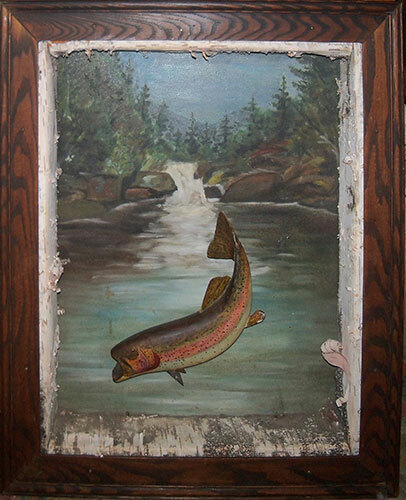 The trout is expertly carved and painted. The backdrop oil painting is of matching skill and quality. The boxed frame is of strongly black grained oak. The inner contrasting white frame is of white birch bark. It does much to enhance the overall effect and reality. All in all, a once in a lifetime find. The 3 dimensionality has to be seen in person to be fully appreciated. 23-1/2 " wide x 29" high x 4" deep.